Replace your 5.0 fuel pump eccentric while finishing up your engine build with this 1979-1985 Mustang Comp Cams fuel pump eccentric & finishing kit! We've all been there. The first weekend in forever you've been able to work on your car. A fresh short block awaiting assembly. No shortage of motivation. Then you realize that your head dowels are missing, the timing cover dowels are damaged and you're missing a few key bolts. Don't waste your entire weekend searching for parts when you can get this all in one kit from Comp Cams! This fuel pump eccentric and engine finishing kit is intended for 1979-1985 Mustang 5.0L equipped with a carburetor. It is also a great kit if you are converting to carburetor from EFI! The kit includes all of the small, but important, camshaft and timing hardware. A new fuel pump eccentric is included to power your mechanical fuel pump. Comp Cams quality makes this a must have for any 5.0 engine! 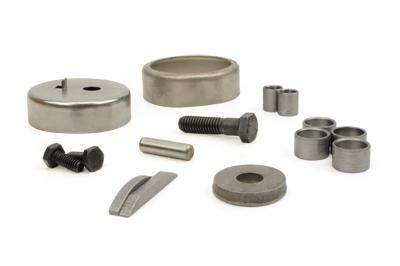 COMP Cams manufactures truly superior hydraulic and solid flat tappet, hydraulic and mechanical roller, and overhead camshafts for Latemodel Mustangs and Lightnings. Comp Cams are designed and manufactured using cutting-edge technology and the finest engineering in the industry. Whether your engine is naturally aspirated, run nitrous, a supercharger or a turbo, Comp Cams make more horsepower than any other. Looking for that ultimate hard-hitting Mustang idle? Check out the aggressive new ThumprCams. Match Comp Cams camshafts up with their competition-grade lifters, valve springs, timing sets, and other supporting components, and you’ll experience the ultimate in race-winning reliability!